(Nanowerk News) Typically satellites launch from Earth, requiring dedicated launch vehicles to propel them into the proper orbit. The cost for this launch scenario could be reduced considerably if there was another way to get the satellites into their optimal orbit. The Japan Aerospace and Exploration Agency (JAXA) found a way to cut the costs of this activity by designing a small satellite launcher, installed recently on the International Space Station. The Japanese Experiment Module (JEM) Small Satellite Orbital Deployer (J-SSOD) is capable of launching small satellites from the station, using the JEM Remote Manipulator System, which is like a small robotic arm. 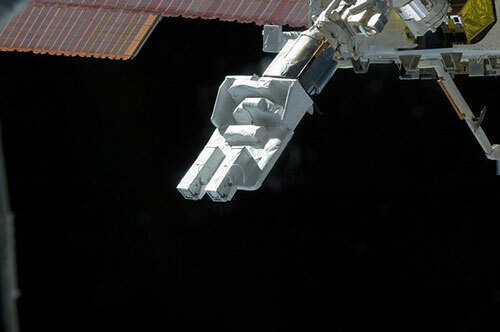 In the Small Sat Deploy-Demo, the remote robotic system grappled and retrieved the Multi-Purpose Experiment Platform, where the J-SSOD is installed and loaded with the small satellite(s). There are two chutes on the deployer, with each chute holding up to three satellites. While attached to the robotic arm, the platform is released from the JEM Airlock, and positioned away from the station for safe deployment of the satellites. The deployer allows for additional launch opportunities for these miniature satellites, while demonstrating new technologies for air, water and surface monitoring. This is a new capability for the space station, allowing for the launch of smaller satellites from a permanently manned orbiting vehicle. The J-SSOD also allows the crew to power up the satellites right before deployment, as opposed to when the satellites are loaded onto the launch vehicles. This not only extends the battery life, but allows the crew to check functionality and make simple repairs, if necessary. Since the mini-satellites, or CubeSats, are delivered to the space station packed securely inside a vehicle, vibrations and environmental changes are less of a concern. These changes allow for a range of new future possibilities regarding small satellite design. CubeSats are small satellites introduced in 1999 and designed by California Polytechnic State University. They are approximately 4 inch (10 centimeter) cubes, weighing no more than 2.7 pounds (1.2 kilograms). Each satellite produces its own power, and is designed with solar panels and capable of transmitting signals. The J-SSOD and the five satellites deployed in this demonstration arrived at the station on the JAXA H-II Transfer Vehicle 3 (HTV-3) earlier this summer. Students designed and built all of the satellites, with the exception of one. A demonstration of this new technology was performed Oct. 4, deploying five CubeSats, from the Kibo Laboratory, another name for the JEM. JAXA astronaut Aki Hoshide commanded the first deployment from the station, with the second commanded from the ground control team. Using the JEM Remote Manipulator System, Hoshide assisted with the deployment of the satellites that involved several different investigations. RAIKO, a JAXA satellite, is poised to take photos of the Earth through a fish-eye lens camera. This technology demonstration is expected to measure the movement of the satellite, as it deploys, through photographs during the process, along with testing of a star sensor. Star sensors help with spacecraft attitude determination. This is a two unit satellite and is larger than the others. FITSAT-1, also a JAXA satellite, is testing a high-speed transmission module for small satellites, using visible light to communicate by high power LED flashes. The goal is to transmit data close to 100 times faster than current CubeSats. The LEDs are so bright, they might even be seen from Japanese ground sites. The plan is for this satellite to flash LED messages across the sky in Morse code. JAXA's WE WISH satellite is slated to contribute to local technology education, promoting the use of data acquired by small satellites. An ultra-small thermal infrared camera will transmit images back to a ground site. Local ham radio operators also are expected to receive data from WE WISH. F-1, a NanoRacks customer CubeSat, is an educational satellite for FPT University of Vietnam. This satellite takes photos of the Earth to capture atmospheric changes, and possibly tracking ship traffic, as well as detect forest fires. Students also are using this satellite to measure the Earth's magnetic field and temperatures in the space environment, along with several radio/communications experiments. Jeffrey Manber, managing director for NanoRacks, said, "One of the beauties of CubeSat is the building of the cube satellite is an education in itself, leading a new generation to the field of engineering." Manber added that this was truly an international collaboration -- NanoRacks working with NASA, using a JAXA facility to deploy a Vietnamese satellite. NanoRacks is the first company to arrange for the deployment of a commercial satellite. TechEdSat is an educational investigation and a technology demonstration, designed and built by San Jose State University students. The goals of this investigation are to evaluate Space Plug-and-Play Avionics, and test for tracking and communication capabilities using the Iridium and Orbcomm satellite phone systems. The satellite design allows it to transmit temperature, elapsed time, voltage and current, along with any error messages back via ham radio to the students. "The deployment of the CubeSats from [the space station] can be timed to match a sudden increase in solar activity, observations of disaster areas, [or] support of other larger and higher satellite research objectives," said Al Holt, principal investigator for the J-SSOD. "Support of other [station] payloads and student and educational objectives tied to specific time periods," are also options. Using this deployer to launch small satellites not only reduces the cost for this activity, but also allows for much greater flexibility. Lead Increment Scientist for Expedition 33/34 Vic Cooley said about the demonstration, "This is all about adding yet one more capability to our wonderful space station." The station is already being used as a research laboratory, a test bed, and possibly as a stepping stone for moving beyond low-Earth orbit. To learn more about this small satellite deployment system, watch this interview with Cooley.